With temperatures rising and hovering in the high 20’s, the bees have started to fan the hive. 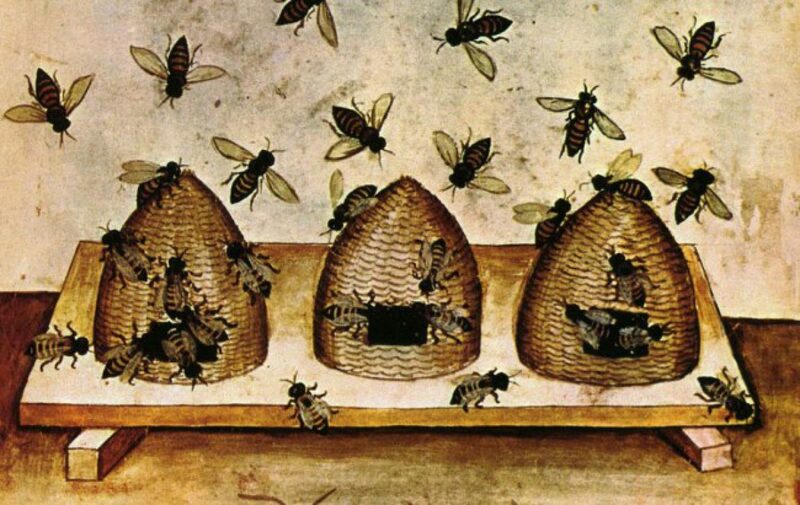 Today things got so extreme many workers came out of the hive and began ‘bearding’. Some of them formed a beard-like clump to hang under their threshold . . . possibly it is cooler by the concrete block. Tomorrow I will remove their doorway, called a cleat, entirely. Let’s see if that improves their situation. Note the birch branches, also helping to shade their abodes in the Grapeyard. The Foragers are streaming in loaded with pollen bags, sometimes they seem to be so heavy they cannot adjust their flight speed and crash into the grass, only to rise and make another attempt into the hive ‘door’. A relentless pace for these little creatures but when it gets too hot, the work stops, just like us.